Matosin N and Newell KA. Metabotropic Glutamate Receptor 5 in the Pathology and Treatment of Schizophrenia.Neuroscience & Biobehavioural Reviews. 2013. 37 (3): 256-268. 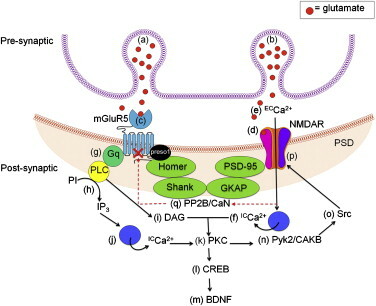 Metabotropic glutamate receptor 5 (mGluR5) potentiates the NMDA receptor (NMDAR) in brain regions implicated in schizophrenia, making it a viable therapeutic target for the treatment of this disorder. mGluR5 positive allosteric modulators may represent a valuable novel strategy for schizophrenia treatment, given the favourable profile of effects in preclinical paradigms. However it remains unclear whether mGluR5 also plays a causal or epiphenomenal role in NMDAR dysfunction in schizophrenia. Animal and cellular data suggest involvement of mGluR5, whilst post-mortem human studies remain inconclusive. This review will explore the molecular, animal and human data to support and refute the involvement of mGluR5 in the pathology of schizophrenia. Furthermore, this review will discuss the potential of mGluR5 modulators in the therapy of schizophrenia as well as aspects of mGluR5 that require further characterisation. Click here to access a pdf pre-print copy.